Siemens has delivered for the first time a steam turbine in the capacity range up to 10 MW that operates almost entirely without lubricants. The bearing systems consist of completely oil-free, air-cooled, electromagnetic bearings. The valve actuators operate with only a minimum oil supply and are controlled via software-controlled electric motors. 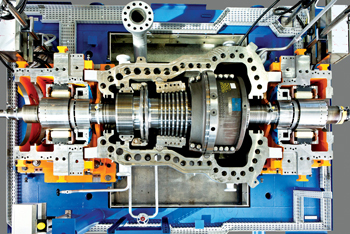 The trial run of the first turbine equipped with magnetic bearings was successfully completed in Vattenfall’s lignite-fired Jänschwalde steam power plant, located in the southeast of the German state of Brandenburg, after which the model SST-600 steam turbine was officially handed over to Vattenfall. The turbine has been running reliably in regular full-load operation since February 2015, at speeds of up to 5,700 rpm. It is used as a feedwater pump drive. The first SST-600 steam turbine with magnetic bearings was developed in cooperation with the University of Zittau/Görlitz and was officially handed over to the customer Vattenfall. Steam turbines equipped with magnetic bearings are more environmentally friendly, as they use nearly no oil, and also offer substantially better fire protection. The oil-free turbine is therefore particularly interesting for customers with highly stringent requirements for operating safety and reliability, such as in the oil and gas industry, or for use in offshore applications on drilling platforms. As the rotor so to speak “floats” without any contact with the bearings and is not supported by a film of oil, there is no longer any wear or friction resistance present, meaning that the efficiency of the steam turbine can, as a result, be increased by up to one per cent. Siemens was responsible for technical project management of the test bay and the prototype project, for design of the steam turbine, design of the magnetic bearings and for the construction, commissioning and trial operation of the magnetic bearing steam turbine.